A call comes in and I am invited to Pow Wow by some friends. I will admit that I was a bit apprehensive – but it seems in life I am the only white guy wherever I go. All good! It starts over dinner with a family of Crow people – eating steak and drinking cowboy coffee over the fire (irony – cowboy coffee made by an Indian). The host is gracious and I tell some funny stories and everyone relaxes because the white guy is okay plus I remembered bug spray 40% deet and we exhausted that can right quick! My friend Clarence ThreeIrons says that if a mosquito bites a Crow man it will die…I guess these mosquitoes did not get the memo. The children are all anxious and as sun sets grandpa, grandma, son and daughter in law all work together to adorn the children in their elaborate Pow Wow regalia. I politely ask to take a few pictures (not wanting to intrude) and they smile – crazy white guy – now who invited him. 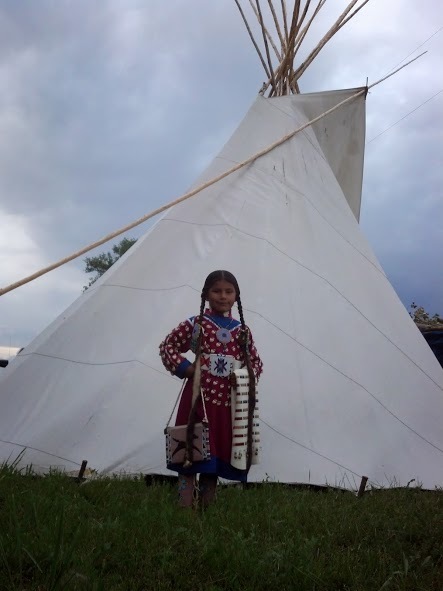 My buddy Tristan’s little girl is the first ready and I get a couple wonderful pictures with her next to the Teepee (no all Indians do not still live in Teepees). 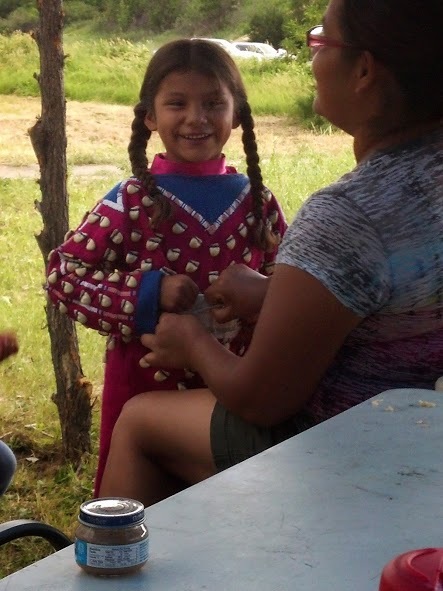 To quote my friend Dr. Mike Weddle ” She looks so proud and self confident.” – speaking of Tristans daughter! 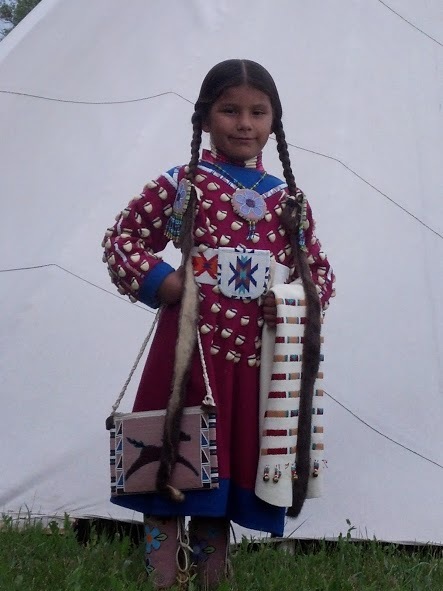 – Eagle feathers, Elk Teeth, and a myriad of beadwork adorn this native child! Family – I am moved by the sense of family! The jingle, shing shing shing and beat of drums mixed with chanting from the Pow Wow grounds is overpowering my senses. 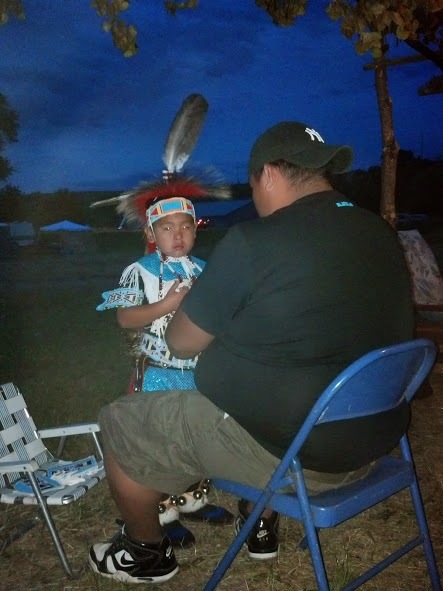 I let my mind drift as Tristan’s dad gives me an oral history of his families Pow Wow dancing. I see the dancers moving in grace, young and old, love for culture, for being Indian and keeping tradition. 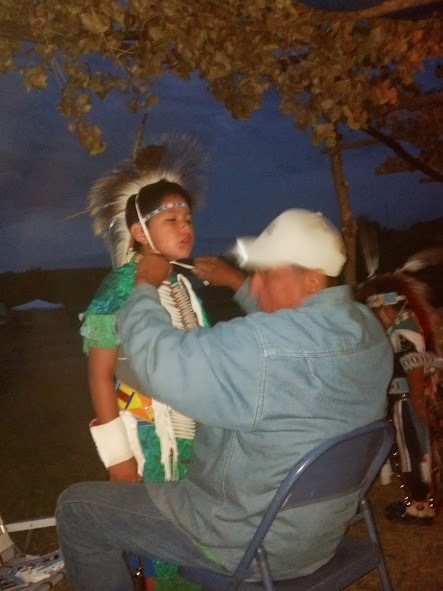 He explained face painting and outfits, the Crow Hop and other dances all moving to the drum and chanting. 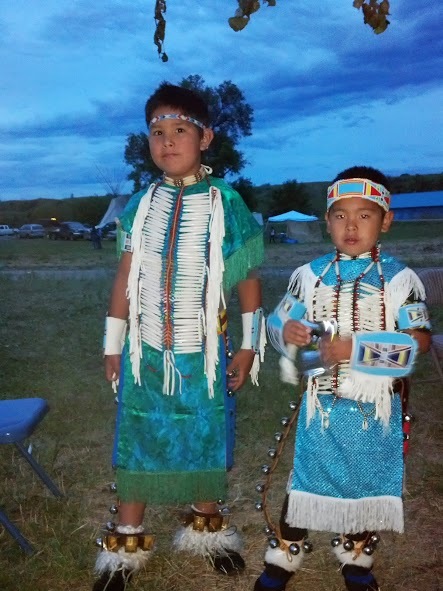 I let myself slip back 100 years to when his great grandfather was dancing at this very same Pow Wow ground and saw the fires, the feasting, the love. I knew I was the only white guy to have this privilege, this honor, to witness this beauty! I only wish my words could convey the intensity of this one evening. Previous postIntegrity / Week Two ! 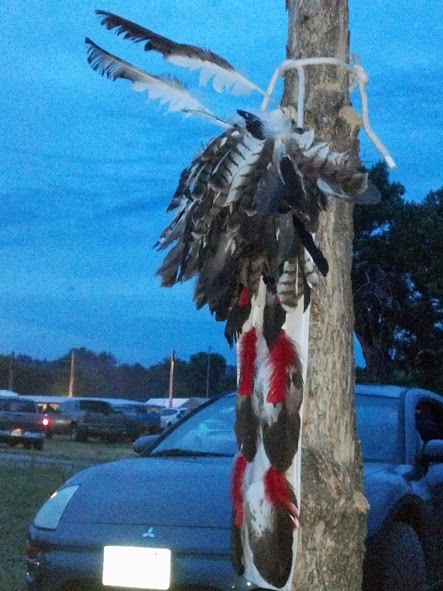 Your pictures of the Crow Pow Wow, are just awesome. Thanks for sharing them. Happy to do it my favorite aunt! Both the story and the photos make me wish I were there. The Crow are truly beautiful people. Wow what a cool way to spend an evening! 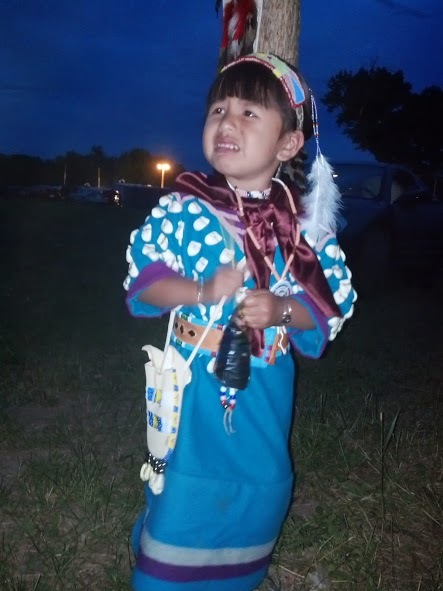 Some day I hope to get to a Pow Wow with Dianna. Great pictures. thanks Jon – come on out! Dude, Crow Fair is one of my most favorite things in all the world. Glad you got to hang with a fam. that is a real honor. I can relate with your senses getting a bit overwhelmed when the drum is booming and all the dancers are swirling-whirling. There is nothing else like it in all the world. THAT is real Montana. Thanks Alex – it was awesome! Our own mini version of Crow Fair here in Lodge Grass! thanks for taking time and reading! Those are wonderful pictures you took. It makes my heart sad that you refer to yourself as the white guy. You are a human being, and deserve to be treated as such. The purpose of the Pow Wow is for ALL OUR RELATIONS to attend and come together, so you are always welcome to pow wows. Thank You for sharing your experience and I look forward to reading more of your journey in life. Thank you – I never really think of myself as “white guy” just for the humor – I am married into the Navajo Nation and love all my friends and most of my relatives…jk…Thanks you – now I need to find a local sweat because nothing I miss more!